1987. Vicki (Ashleigh Cummings) sneaks out to go to a party. As she walks along the street, a car stops and Evelyn (Emma Booth) and John (Stephen Curry) offer her a ride, and the possibility to buy some dope. Vicki agrees and drives home with them. Once there, though, Evelyn and John tie her up and what began as a night of teenage partying turns into a fight for survival for Vicki as she tries to get between Evelyn and John. Hounds of Love tells a story based on the Moorhouse murders of which I knew nothing before going into the film, but I have to admit that it did feel very realistic. Nevertheless, it somehow lacked the emotional impact I expected from the description of the film. Ultimately, Hounds of Love is a film about relationships. John and Evelyn are an intense couple, entirely focused on each other. Or so it appears at first. Vicki is smart enough to see the cracks between them and try to widen them to turn them into her own advantage and survival. That dynamic was convincingly written and very well acted by all three of the actors. But it’s also an exhausting dynamic and it did tire me a little to have to watch it. And that I reacted with even a little tiredness to what should be a tense and horrifying experience shows that somehow something somewhere went wrong, even if I can’t put my finger on what exactly. But for most of the film, I was right there in that house with the three characters and caught up in Vicki’s fight. Supported by the great soundtrack and really good cinematography that proves you don’t need big landscapes to be visually effective. It’s a strong film, especially for a feature debut and even though not every single minute of it works, it’s well worth watching. 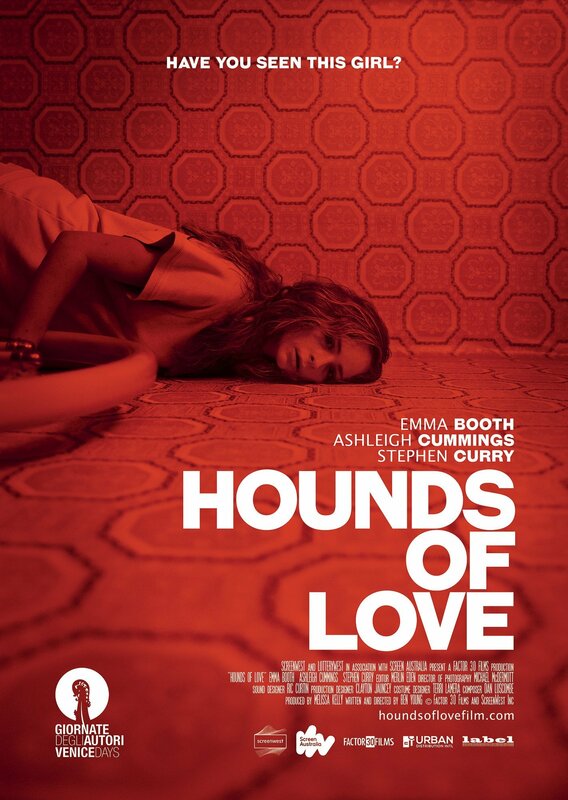 This entry was posted in movies and tagged /slash Filmfestival, 2016, Ashleigh Cummings, Ben Young, Damian de Montemas, Emma Booth, Fletcher Humphrys, Harrison Gilbertson, Hounds of Love, Stephen Curry, Steve Turner, Susie Porter by kalafudra. Bookmark the permalink.